A little bit of an unscheduled break in posting. I went away for a few days last week, kind of last minute so I didn't have time to schedule anything. I'd planned on scheduling things at the weekend but that got put to one side as I spent most of it waiting at my nearest A&E, having numerous xrays and still not quite knowing what's wrong with me. So whilst I'm stuck on bed rest, what better way to spend my time writing new posts. 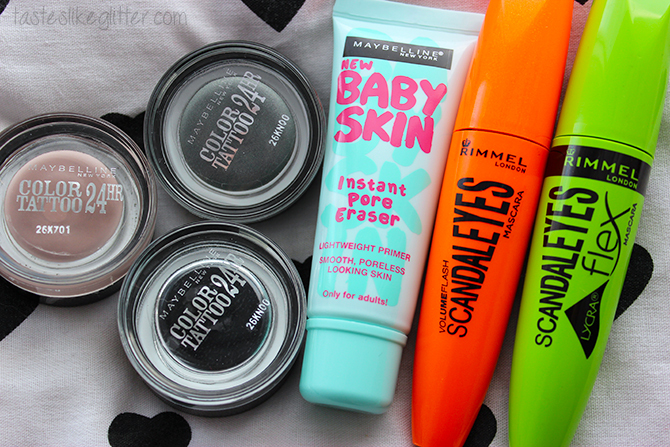 I recently picked up a few things in Boots that I've been meaning to try. Even sweeter that I managed to get a massive £10 in bonus points. The Maybelline Color Tattoo's have been compared to M.A.C Paint Pots in terms of formula and longevity but I wasn't convinced. I have one M.A.C Paint Pot in Blackground, a rich gunmetal with multi coloured shimmer but it was one of my first M.A.C purchases so it's a little dried up now. Since getting On And On Bronze in the Christmas Glossybox I've changed my mind. They're a fraction of the price of Paint Pots (£4.99 / 3.9g vs £15 / 5g) and whilst they aren't dupes for any the M.A.C shades and the texture is a little lighter and creamier, they really are just as long lasting. I picked up a couple of shades that I can use when I'm in a rush but still want something on the eyes. Also as something to use underneath my Urban Decay Naked palette, as I found that On And On Bronze was a really good base for that palette. The ones I decided on were Permanent Taupe, Immortal Charcoal and Timeless Black. Something to note about the shade names, in Europe they have completely different names and numbers than they do in the US which seems kind of silly. That turned out to be longer than intended, oops! Moving on ... My favourite foundations are silicone based so I also tend to favour silicone based primers so they work together rather than against each other. As with the UK launch of Baby Lips, everyone seems to have gone mad for the Baby Skin primer so I thought I'd give it a whirl. I also picked up two new mascaras just because I tend to like a few cheaper ones in my stash. The Volume Flash says it's super super black and gives lots of volume. The Lycra Flex has claims that you don't get that crispy lash effect. 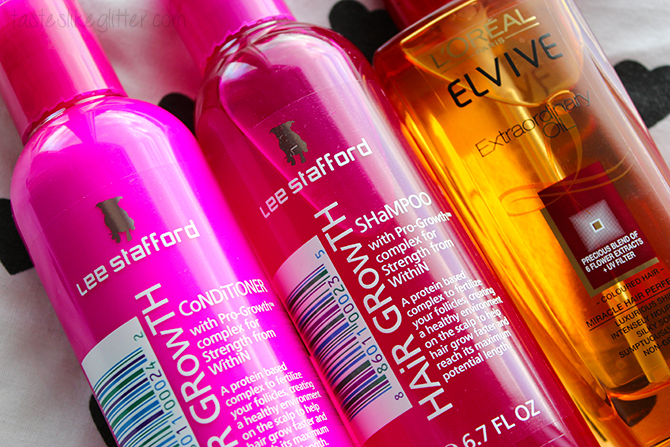 I'd ran out of my current shampoo and conditioner so I opted for the Lee Stafford Hair Growth range. I'm currently trying to grow out my hair so whilst I'm dubious whether this will actually work, anything that might help it along is always a bonus. I have the shampoo, conditioner and not pictured, the deep conditioning treatment. And last but not least, hair oils became a massive thing last year. Since my hair was so short I didn't really feel the need to use them as I just felt like it'd weigh what little hair I did have down. For a while now I've been lusting after the L'Oreal Extraordinary Oil. Even more so when I found a coloured hair version in Boots. The amount you need is so small that this 100ml bottle will last you for ages! That has to be the most talkative haul type post I've ever made, I guess that's what happens when you don't post any content for a week. It's been a little while since I picked up some new makeup bits so I'm looking forward to trying them. Product reviews and makeup looks will be up once I've had a chance to try them properly.